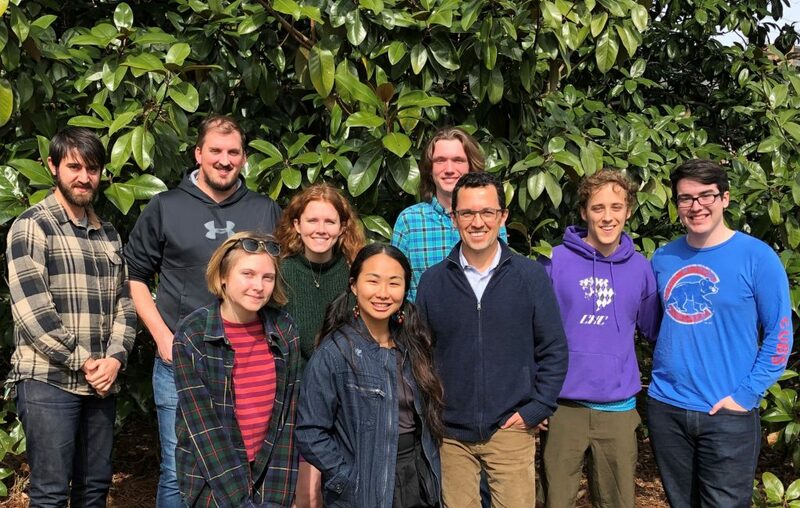 The Carbonshed Lab, Spring 2019. L to R: Joseph Delesantro, Andrew Murray, Hannah Ratcliff, Meredith Emery, Tianzhen Nie, Zach Leighton, Diego Riveros-Iregui, Will Hamilton, Rhyan Stone. Not pictured: Kriddie Whitmore. Headwater streams are the small streams that carry water from the upper reaches of a watershed to the main channel of the river. Headwater streams connect terrestrial and aquatic ecosystems and have a high proportion of stream water in direct contact with adjacent soils. For this reason, headwater streams play an important role in controlling the biological and chemical quality of waters that are ultimately delivered to large rivers and communities downstream. This study examines changes in carbon and the movement of carbon at the interface of terrestrial and aquatic ecosystems in tropical headwater streams. This project will examine the fluxes of carbon dioxide from different terrestrial and aquatic landscape elements such as upland areas, wetlands, and streams. The results of this project will have direct implications for the natural resource management of high-elevation watersheds that are the source of drinking water for millions of people in South America. Through a partnership with the Museum of Life and Science in Durham, NC, this project will design and implement educational activities directed at large and diverse audiences, including populations that are traditionally underrepresented in the sciences. This work will enhance the college research experience of underrepresented students in science while empowering them to serve as ambassadors in their local communities. The students will participate in an international research experience focused on hydrological and ecological data collection, and will be supported through a research-intensive, year-long program focusing on increasing their long-term career success. A growing body of work recognizes inland waters as fundamental players in the carbon cycle. In particular, headwater streams are known to remove terrestrial carbon in the form of greenhouse gases such as carbon dioxide to the atmosphere, and as dissolved organic, inorganic, or particulate forms downstream. This study seeks to quantify the role of hydrologic connectivity across multiple landscape elements (i.e., uplands, floodplains, wetlands, and streams) on regulating the partitioning between atmospheric and downstream carbon losses. The study will be conducted in an ecosystem where both water fluxes and carbon storage per unit area are among the highest on Earth: the Andean Paramos of Ecuador. Results from this research will provide a comparison of carbon dioxide effluxes across terrestrial and aquatic landscape elements on a per unit area (or per unit time) basis and as a function of the hydrologic wetness status of the year. The broader impacts of this project include the design and implementation of educational activities directed at large and diverse audiences, including populations that are traditionally underrepresented in the sciences. After successfully completing field, outreach, and professional development activities, participating undergraduate students will receive a research designation on their transcript and graduate as Carolina Research Scholars. Materials from this work will be used to develop teaching lectures for different audiences, including K-12, undergraduate and graduate students, and the general public.